Fighting over four days in South Sudan’s capital, Juba, following what the government has termed a “failed coup attempt”, has left dozens dead and many more injured, forcing thousands of others to flee their homes, say officials. Close to 20,000 people have sought refuge at the two UN compounds in Juba over the past three days, up from a previous estimate of 10,000, according to Toby Lanzer, the UN Deputy Special Representative of the Secretary-General (SRSG) and Resident and Humanitarian coordinator in South Sudan. The fighting erupted on 15 December, when soldiers loyal to former vice president Riek Machar allegedly attacked the Al Giada army headquarters on the outskirts of Juba, President Salva Kiir told the nation in an address on 16 December. The violence quickly spread across Juba, whose streets were teeming with security forces. On 17 December, heavy shooting erupted near Machar’s house in Juba, but it is still unclear whether he has been arrested or if he is even in Juba. Machar has denied involvement in the alleged coup, according to an 18 December article in the Sudan Tribune. "There was no coup. What took place in Juba was a misunderstanding between presidential guards within their division. It was not a coup attempt. I have no connection with or knowledge of any coup attempt," he said, adding that he and his arrested colleagues were being victimized for no reason. Several South Sudanese officials have been arrested in connection with the coup attempt. According to the International Committee of the Red Cross (ICRC), the clashes have left hundreds in urgent need of medical care. “Thousands of civilians, including women and children, have fled their homes in search of safety, taking very little with them. The International Committee of the Red Cross (ICRC) is providing the city's two major hospitals with support so that they can cope with the heavy influx of patients,” stated ICRC on 17 December. The ICRC spokesperson, Cynthia Lee, would not confirm to IRIN whether they are seeing gunshot-related wounds, but said all injuries at both hospitals are related to the fighting. She said the staff at Juba Teaching Hospital has already performed more than 70 emergency surgeries. According to Ministry of Health Undersecretary Makur Matur Kariom, who is working at the Juba Teaching Hospital, “The situation is quite busy, but it’s manageable.” Most of those seeking treatment have been civilians. At least 26 patients have died at the hospital, and there are fears about those unable to reach the facility for treatment. “Whoever died outside the hospital, we don’t have their numbers,” said Kariom. Early on 17 December, another clinic at one of the UN compounds reported that it had treated 39 patients, including five children. According to Joseph Contreras, a spokesperson for the UN Mission in South Sudan (UNMISS), they are trying to treat as many people as possible, though help is only available to people who make it into the compound. Awut Deng, the minister of gender and social welfare, on 17 December called for blood donations to assist the injured. 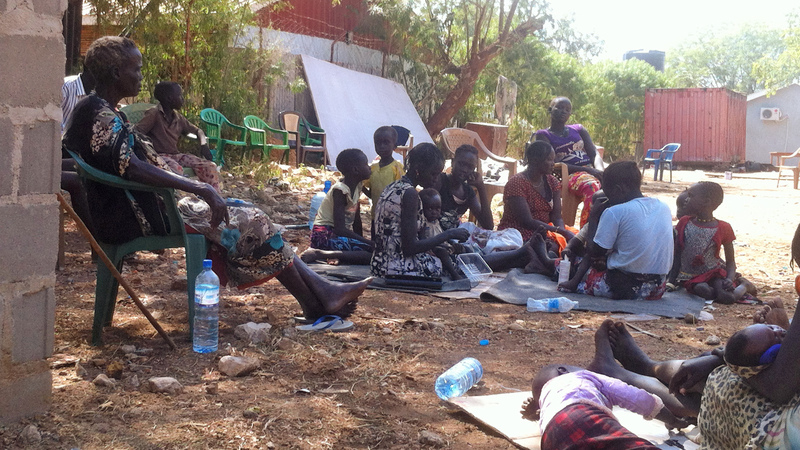 Women and children have set up camp under the scattered trees of Juba’s Episcopal Cathedral compound. Sebit Albino said fighting broke out in her home area late on the night of 15 December. She fled at daybreak with 18 family members, running most of the 10km to the cathedral, where they spent the night of 16 December. “It is difficult because the cold is disturbing us here and we left our luggage. Even getting something to eat is very difficult,” said Albino. Security officials said that they are trying to contain pockets of fighting across the city and allow people to return to their homes. But some people do not know what they will be going home to. Abraham Kolnyin was living at the Al Giada headquarters with his cousin, an army officer. He said gunshots started late in the evening on 15 December, but he does not know what prompted the fighting. He tried to run, but the fighting was too intense, he said. Instead, he hid under his bed for most of the evening. Early on 16 December, he fled, wearing only his pyjamas. After fighting moved away from the headquarters, he returned to find all of his clothes shredded and his belongings destroyed. “I have nothing but my mattress. I have never seen anything like this,” said Kolnyin. The events of 15 December may have been the culmination of growing tension within the ruling Sudan People’s Liberation Movement (SPLM) party. In July, Kiir sacked Machar and other members of his cabinet. Since his dismissal from office, Machar has repeatedly said that he plans to challenge Kiir for the leadership of the SPLM. Alongside other high-profile SPLM members, he accused Kiir earlier in December of “dictatorial tendencies” in the running of SPLM. Jok Madut Jok, head of the Sudd Institute, a local think tank, said that while he believes the fighting was initially over political loyalty, “there is definitely a worry that if the situation continues as it is, that it might actually become tribal if it is prolonged”. Kiir belongs to the majority Dinka ethnic group, and Machar is an ethnic Nuer. Jok said that he is concerned fighting between those groups could break out across the country. The fears of ethnic conflict were reiterated in a 17 December church leaders’ statement. “There is a political problem between leaders within the SPLM. This should not be turned into an ethnic problem. Sadly, on the ground it is developing into tribalism. This must be defused urgently before it spreads. Reconciliation is needed between the political leaders,” said Archbishop Paulino Lukudu Loro on behalf of various church leaders, who offered to mediate in the crisis. Earlier this week, UN Secretary-General Ban Ki-moon expressed concern “about reports of fighting between members of the SPLA in Juba and about the risk of targeted violence against certain communities”. “It is essential that the government guarantees the security of all civilians regardless of their communities of origin,” he said in a statement. Chairperson of the African Union Commission Nkosazana Dlamini-Zuma, on 17 December, urged “the government and leadership of South Sudan and all other stakeholders to exercise maximum restraint and avert any further escalation”. On 17 December, after leaving an emergency cabinet meeting, Mawien Makol Arik, the foreign affairs ministry spokesman, said that the military believes it now has the situation under control, although there are still reports of fighting at Juba’s outskirts. The Juba airport, which was closed, is expected to resume operations, according to an 18 December government statement, in which government spokesman Micheal Makuei, also the minister of information and broadcasting, called on “water suppliers, bakeries and other essential service providers” to resume work. Makuei further urged those who have fled their homes to return. But a city-wide dusk-to-dawn curfew remains in place and police checkpoints dot most of the major roads in Juba. Refuting claims that ethnic Nuer are being targeted in the fighting in Juba, Unity State Governor Simon Kun Pouch said in the government statement: “There are people out there saying what has happened is between the Dinka and the Nuer tribesmen. We, the leaders of this country, would want state here that this is not true.” Some of the people supporting Machar are Dinkas, others are Chol, Nuer or from other tribes, he said. South Sudan has been struggling to contain a long-running ethnic conflict in its Jonglei State, which has led to thousands of deaths and massive population displacement. (Read IRIN’s Briefing on Jonglei).